Successfully Added 68 Key Folding Keyboard - Bluetooth 3.0, 310mAh Battery, Function Keys, Ergonomic Design, Long Battery Life to your Shopping Cart. 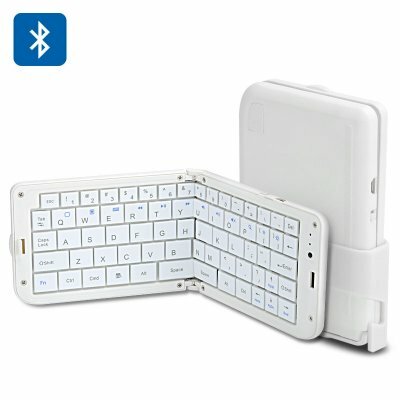 Productivity for your phone and tablet in your pocket with this 68 Key folding Bluetooth keyboard. While swiping and finger typing on your Smartphone's touch screen is fine for those 140 character Tweets or Facebook updates its hardly suited to writing an email or jotting down notes in class or writing documents. When it comes do doing proper work you need a Bluetooth keyboard. With 68 keys and a size that's suitable for typing documents of any length this folding Bluetooth keyboard is the perfect size for your fingers and your pocket. Its small enough to carry around at just 127 x 88 x 22mm and only 170grams this mini Bluetooth keyboard is the ideal solution for portable productivity. This universal folding keyboard can sync with your tablet, or Smartphone and works with almost all Bluetooth enabled devices. With its built in 310mAh battery you can enjoy 8 hours of work per day for up to 30 day before the battery needs recharging. The folding keyboard comes in a plastic sleeve that doubles as a stand for tablet or phone letting and offers a great working angle that can accommodate most devices even large screen devices. There are a number of media function keys and with its 10 meter range the keyboard works well with everything from TV box, Smartphone, tablet and other devices as its compatible with a Win7 Windows XP, Vista, iOS 6.0 or above and Android 3.0 or above devices.